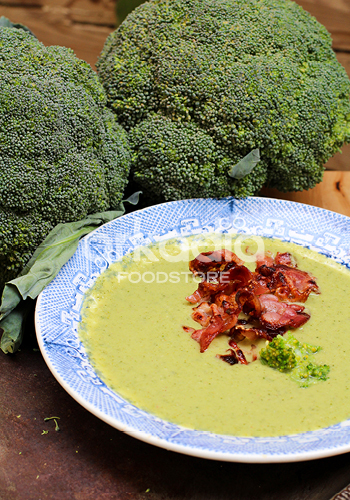 This is I nice cream broccoli soup ideal for a cold and chilly day. The streaky bacon gives that touch of saltiness to enrich the flavour and of this wholesome bowl of green joy. Peel, trim and wash the onion, garlic and leek. Cook in the melted butter and olive oil for about 6 to 8 minutes. Add the local celery and the white wine. Cook for a few minutes and add the broccoli and potatoes. Add the boiling water and season. Cook for about 40 minutes. Remove from heat, stand for a few minutes, and then blend until smooth and even. Add the cream cheese, blend and serve with rashes of grilled streaky bacon on top. 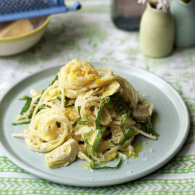 This recipe has been reproduced from the foodie | Issue 19 (Jan-Feb 2012).